Intending Participants must be between the ages of 10 to 15 years. The directors reserve the right, at their discretion, to withdraw any camper whose influence or actions are deemed unsatisfactory, dangerous or incompatible to the Camp community or who will not live within the rules and regulations of the Camp. If this occurs, no reduction or return of fee, or any part thereof will be made. All students must come with smart and casual clothing. No female camper should come with trousers except pajamas which should be worn only in the hostel. SSTAC reserves the right to add or remove terms from these conditions without recourse to the parents or guardians. Children maintaining the highest standard of conduct is required at all times. Using profanity, disparaging dialogues, physical violence or threats during participation in the Camp is strictly prohibited. By accepting these Terms and Conditions, parent/guardian confirm that his/her child has permission to participate in all camp programs. 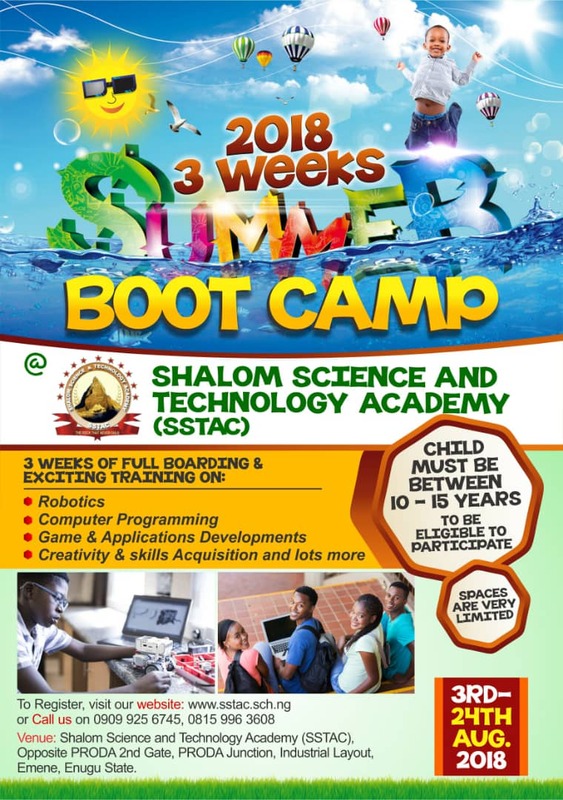 By accepting these Terms and Conditions, parent/guardian confirms his/her acceptance that his/her child may be pictured/photographed and that such material can be used by SSTAC for promotional and advert purposes. In the event of sickness and the parent/guardian cannot be reached in an emergency when child is under the Camp supervision, by accepting these Terms and Condition, the parent gives permission to a doctor/nurse to attend to the child as needed. All your child's personal belongings are their own responsibility, unless loss or damage is proven to be due to the Camps negligence. Expensive and treasured items such as jewelry, designer clothes or shoes, trainers, etc., should not be brought to the camp. All children at the Camp are prohibited from bringing or using all tobacco products, alcohol and illicit drugs of any kind. Parents can buy provisions as they deem fit and give to the child(ren) on or before arrival. The directors or staff of the summer camp will not allow bringing in of provisions once the camp has started. Parents agree to support the Camp success by encouraging children to abide by the highest standards of positive conduct. Remember SSTAC is a Christ Centered Secondary School and only standards from the bible will be upheld. Participants should come with casual smart wears, sweaters and jackets as needed and a smart shirt and tie or dress for female participants for the end of ceremony dinner and award night. Opposite PRODA second gate,Industrial layout Emene, Enugu Nigeria.